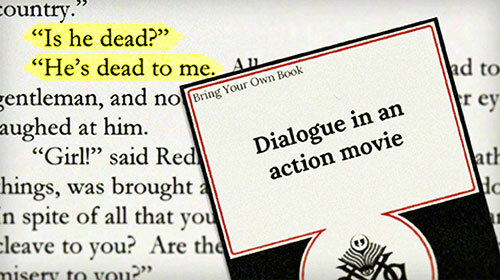 Friends of mine have created a new game called Bring Your Own Book, the game of borrowed phrases. They debuted the game at PAX South this past weekend and currently have a Kickstarter up (and they’ve already made the goal, yaaaay!). I was lucky enough to get to play the game in a beta version and it was really fun. Go have a look! Really Awesome Black Bean Burgers | Serious Eats : Recipes. Adding to my list of things to make. winter hibernation cooking | Ask MetaFilter. 13 Food World Predictions for 2015 From Andrew Knowlton – Bon Appétit. Bookmarked for the Mae Rose Cocktail recipe. Behind the Bar: Leela Cyd’s Grapefruit Spritz | Design*Sponge. Why are Some Croissants Straight, and Others Curved? | The Everywhereist. France has laws about this, laws! Giant Creamy White Beans with Kale – Genius Recipes. This continues to be one of my favorite bean recipes from 101 Cookbooks. Via Bean Month at Ciao Samin. Chocolate glue gun | Evil Mad Scientist Laboratories. Frappato From Sicily: A Great Dinner Red Wine – Jameson Fink. Bring Your Salad to Work Week – the Ugly Green Chair. A simple, delicious salad that you can prep a week ahead. The other day I found myself caught between being hungry and lazy. (You know how to know when you’ve become an adult? When you no longer have foodstuffs that don’t require thirty minutes of cooking and other ingredients to make them edible. That’s how.) We had almost nothing to eat in our house but I just couldn’t get myself to put on pants that were respectable enough to go to the grocery store. And then (! ), accompanied by rays of sunlight and angelic music, I found a jar of homemade tomato sauce in the back of my freezer. Suddenly (or with ten-ish minutes of effort) I’d gone from So Hungry to eating delicious tomato sauce on polenta (always stock corn grits for times like this) topped with an egg. I ate this again for lunch since new food hadn’t magically appeared in my fridge. Having this tomato sauce in my freezer made me feel like a genius. Or at least somebody who is occasionally able to feed myself with dignity. Simmer uncovered for 45 minutes. Done. Ok, there is a little more than that. You let the whole thing simmer slowly for about 45 minutes and near the end crush the tomatoes with the back of a spoon. Discard the onion before serving. Done and done. For a more detailed version of this see Orangette, or Amateur Gourmet, or Smitten Kitchen. For this recipe I make a double batch. Doubled it fits in a 4-quart dutch oven nicely and I freeze the leftovers in portions for later. 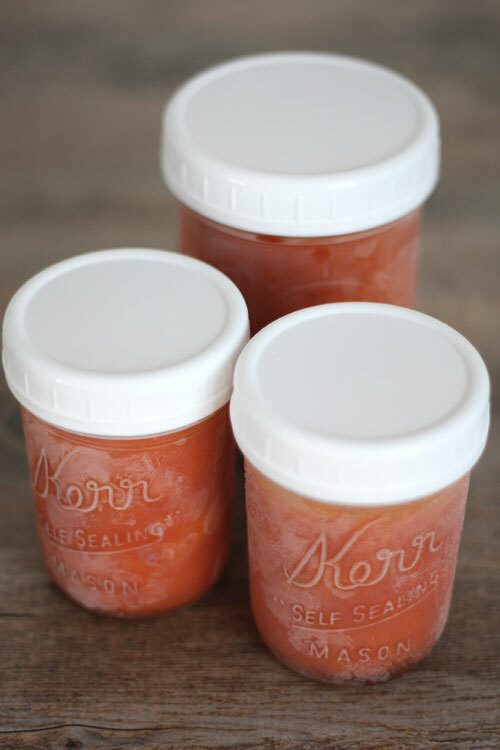 I’ve been using small canning jars (note: affiliate links) with the very handy plastic screw caps lately for freezing foods, it’s easy to take of the lid and thaw the whole thing in a microwave. Or at least I find the jars less fuss than I anticipated them to be. I bought a bunch of jars a few years back expecting they’d eventually be cycled out of my house when giving food gifts to friends and I’ve honestly been surprised at how much I enjoy using them for dry food storage and freezer storage. The caps, though, make all the difference. They are easier to remove and clean and keep track of and won’t rust. This is a little tip I learned somewhere that I cannot recall. (I think Cook’s Illustrated?) 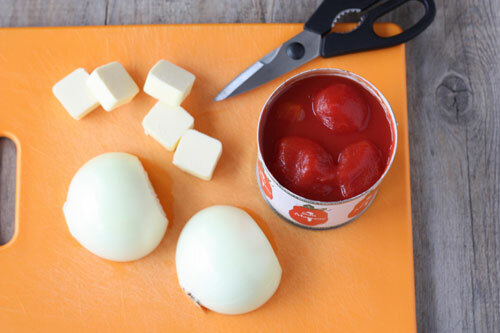 If you want to break up whole canned tomatoes with as little mess as possible use kitchen scissors to cut them up while they are still in the can. This recipe doesn’t require you break up the tomatoes first but I do it anyway because I can get a little obsessive over smashing the tomatoes later on and I like to give myself a head start. 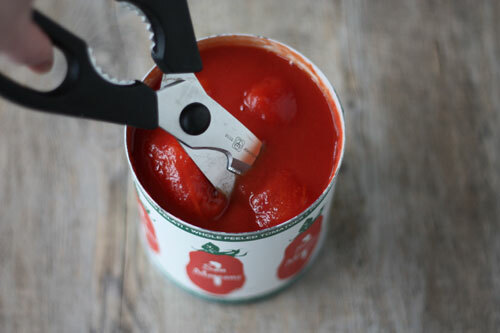 I’ve read that when deciding whether to buy whole or diced or crushed canned tomatoes it’s better to buy whole because there is less processing time before the tomatoes hit the can so they are fresher. I’m not sure if this is true but it’s good to keep in mind. Maybe a taste test is in order? While I’m here let me just say that I’m totally in love with my no-sharp-edges can opener. I know there are not exactly breaking news but every time I open a can I find myself being gushingly appreciative of not being able to cut my fingers on anything sharp. (Because I did, every time.) I own the Zyliss and have no complaints. Sweethome recommends the OXO Good Grips version. In conclusion: not having the culinary equivalent of a throwing star weapon in your trash is good. Ok, go, make the easy sauce and feel like a genius. What’s the best chip+PIN card I can get right now for a trip to Europe? | Ask MetaFilter. I was addicted to Serial, now what?! by Third Coast – ThingLink. Scent sucker revisited | dooce®. “It kind of smells beachy? Like you spent all day at a beach, but not a lame touristy beach, maybe like some secret cove where Daniel Craig would take Rachel Weisz and then later he’d shower before dinner and put on a crinkly button-down shirt and this is how he would smell.” By Sarah Brown. The Renovated Cinerama Deserves the Hype | Slog. (Ed note: the Cinerama is a movie theater in Seattle worth treating as something to check out if you’re visiting the city. They have chocolate popcorn. No, really.) “The huge space is now fitted with a 160 speakers, and each speaker is dedicated to a particular sound in a movie. All of this sonic richness is mixed and intensified by Dolby Atmos, a surround sound monster conjured by Dolby Laboratories. The goal of these improvements is of course to stun our senses in a way that no home theater system ever can.” Sold.